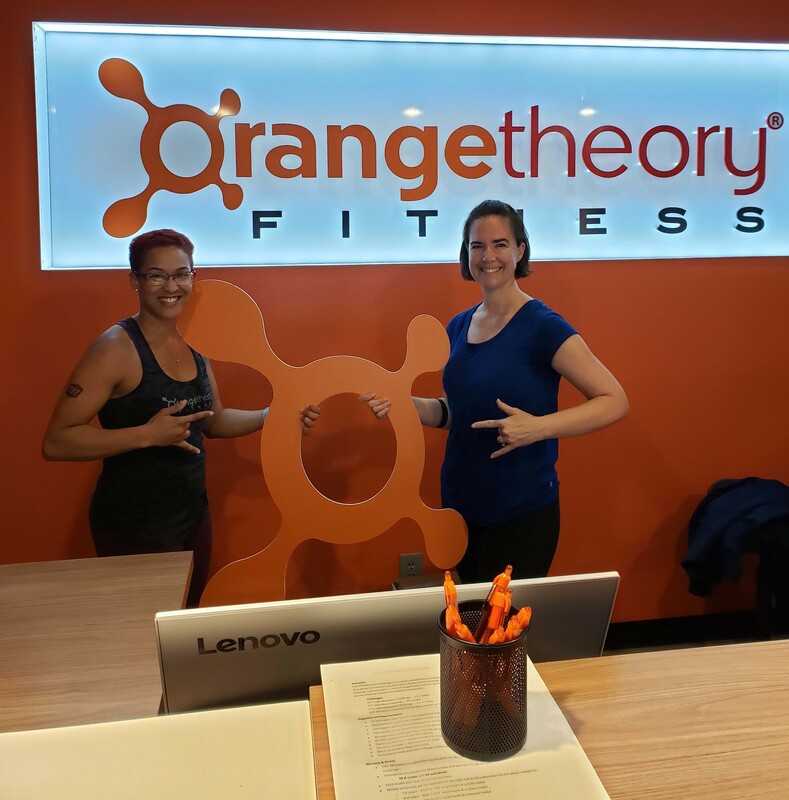 Orangetheory Fitness combines three aspects into one workout: science, coaching, and technology. One can’t work without the other: this trifecta is essential for our workout, and essential for you. More science, more technology, more coaching. More life. To welcome you to Orangetheory, we’re giving you a free class*. Select a time to begin. * First-time visitors and local residents only. Certain restrictions apply. $28 minimum value. Free class not available at all locations. Yes, send me transaction and reminder emails/texts. Yes, send me marketing emails/texts. An error has occured. Please try again later.An error has occured. Please try again later. Think you need to be a runner to reap the benefits of treadmill workouts? 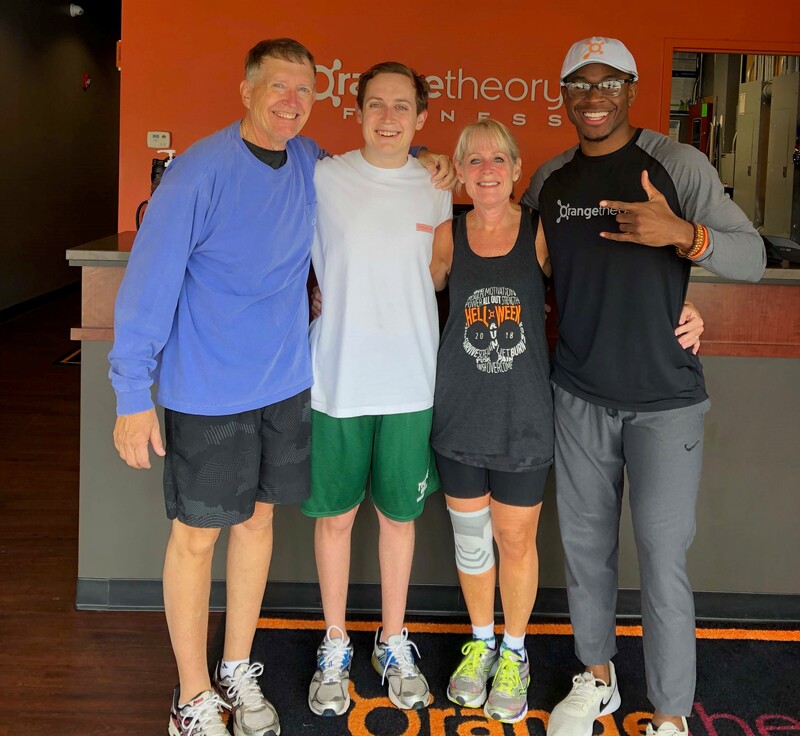 When Rebecca S. of Atlanta stepped foot into the Howell Mill, GA, Orangetheory Fitness last July, she’d never been inside a gym in her life. Rebecca attends classes five days a week and has gained so much confidence, speed and endurance that she joined the April Marathon Challenge and plans to walk and jog at least 26.2 miles during her classes this month. Not only is 30 minutes of walking a day enough to improve mood, promote weight loss and decrease risk for chronic disease, paired with the accountability of Orangetheory’s coaches and fellow members, it can also turn you into an accidental athlete capable of doing things you never thought possible — like finish a marathon. That’s the intention of Orangetheory programming, according to workout design manager Caitlin Donato. In other words, whether you’re a first-time gym-goer or elite athlete, you’ll find yourself clicking the “up” arrow on the treadmill to go .1 or .2 mph faster each class, walk or run harder for longer and recover more quickly from those challenging efforts. While he once dreaded the treadmill, he said it’s now his favorite part of class. Since joining in November 2015 and attending regular classes, he went from alternating walking and jogging to running a 10-minute mile — and even plans to sign up for a 5K this year to test his newfound skills on the road. 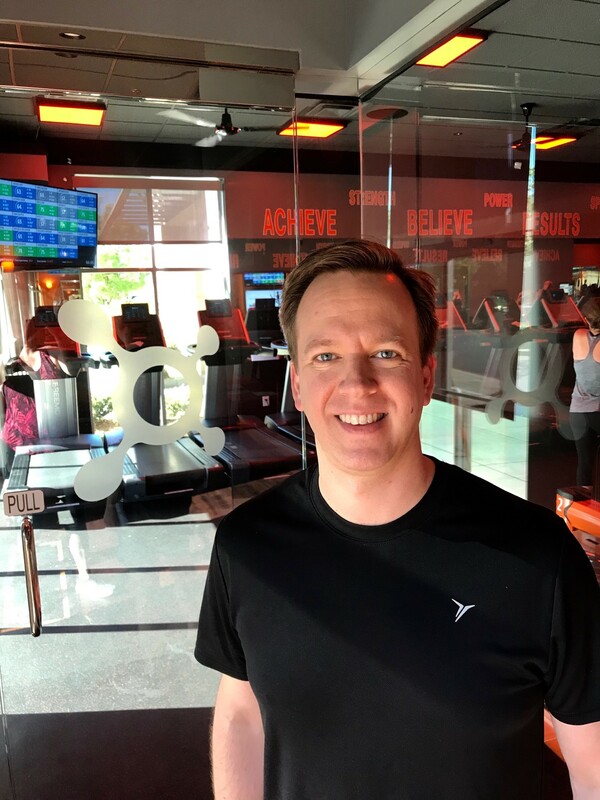 “Having defined goals like the marathon challenge and shared accountability with other members are things I really appreciate about Orangetheory,” he said. Hannah B., a member at the Brookhaven studio in Atlanta, has also seen firsthand the benefits of treadmill workouts on her endurance. “Before joining in July 2016, I had never really done treadmill classes before, only things like Zumba and the elliptical. 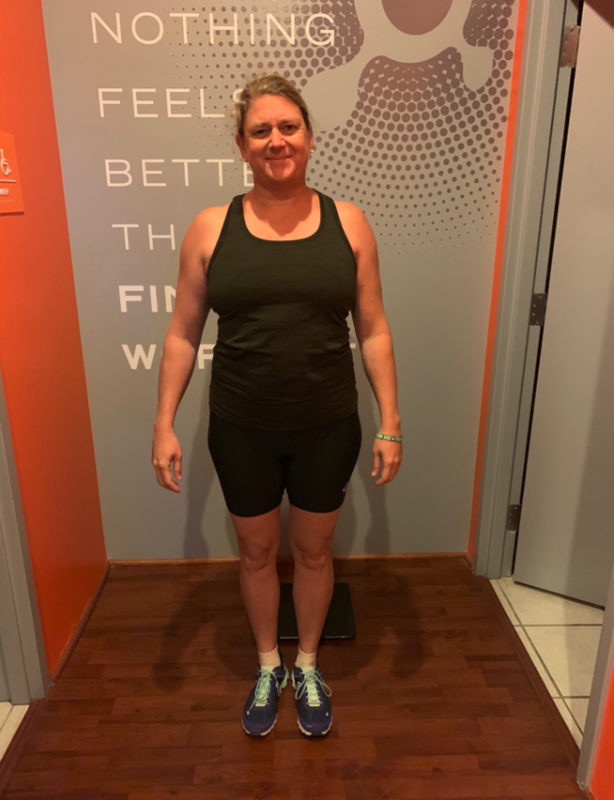 I began Orangetheory as a power walker and slowly worked my way up to sustaining a run the entire class,” she explained. Even experienced athletes can benefit from Orangetheory’s programming. A long-distance runner who got bored training solo, Alison M. of Athens, GA, said increased accountability and improving her speed and endurance were big factors in her joining Orangetheory initially and motivating her to participate in events like the marathon challenge. “The trainers encourage me to increase my pace every few weeks, and the variety of workouts with interval training, inclines and endurance have really helped me on runs outside of the studio,” she said. Competitive rower and recreational runner Kerry B., who attends classes at Emory Point in Atlanta, agreed that Orangetheory and the marathon challenge have helped her with running goals outside of class. And even if an outdoor road race isn’t your ultimate goal, Orangetheory’s programming can help you achieve goals you never thought possible. While the month is halfway over, it’s not too late to join the challenge! Registration is $25/person and all participants receive a “finisher” tee shirt. 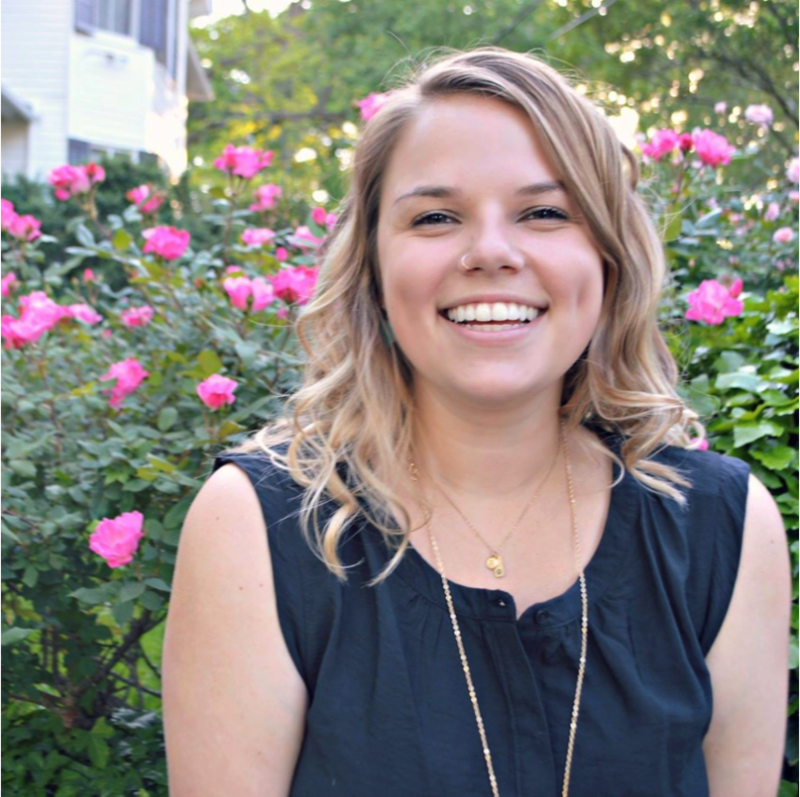 Laura Scholz is an Atlanta-based freelance writer, certified classical Pilates instructor, Boston Marathon qualifying runner and the fitness editor of Atlanta Magazine. Her stories about food, spirits, travel, health, beauty, interior design and more have been featured in The Atlanta Journal-Constitution, Atlanta Magazine's HOME, The Atlantan, Best Self Atlanta, Eater Atlanta, Good Housekeeping, Liquor.com, Simply Buckhead, Where Atlanta, WhereTraveler, TripSavvy.com and VinePair. A longtime resident of Atlanta’s Westside, Laura enjoys traveling, playing the piano and ukulele, attending concerts, hiking with her dog and trying to nail her handstands in yoga class. We know what you’re thinking. You hear “Dri-Tri” and you immediately think this event this is reserved for fitness junkies who thrive on intensity and competition. When you consider a community-backed support system working out alongside you, music that gets your heart pumping, and coaches that inspire your next step, rep, or row, Dri-Tri isn’t only reserved for the hard-core athletes. It’s for all levels – including you. For all you first timers out there, take advantage of these tips to motivate and encourage you to reach your personal best during the ultimate personal fitness challenge, the OTF Dri-Tri. This out-of-water triathlon is a semi-annual fitness event consisting of a 2000m row, 300 bodyweight reps, followed by a 5k run on the treadmill. It’s hosted twice a year to provide you the opportunity to track your progress over time. Maybe you’ve completed one of these benchmark exercises at one point during class, but the mere thought of completing them all at once already has your stomach in knots. We’re all in this together. Think of those around you not as your competitors, but as your inspiration to push yourself to your optimal potential. The only real competition is with yourself, and it ultimately comes down to your personal growth and development. Technology is on your side. Your heart rate monitor was designed to help you gauge your level of effort. So, listen to it. If you’re confident and feeling alive in the Orange Zone, push harder. If you can’t catch your breath in the Red Zone, take it down a notch. You’re not doing your body any favors by ignoring your heart rate – It’s the only muscle that gets to the heart of fitness. The music will help your mental game. The beat of the music releases feel-good chemicals in the brain and can serve as a natural pain reliever during your All-Out moments! Take note of these 3 helpful tips to ease those first-time jitters before you hit the ground running. During the row, pace yourself. The common mistake of all first-timers is jumping on the rower, only to burn out at the 200m mark. There’s no worse feeling than realizing 1) You’re already burned out, 2) You’ve got 1,800m to go, and 3) it’s only the first leg of the event. Don’t make the mistake of exhausting all of your energy on your first power pull. Rather, focus on perfecting the movement with longer, more efficient strokes to keep some gas in the tank. Here’s a little tip – warm up during the first 300m to get into a rhythm, stay consistent for the next 1400m, and ramp up the last 300m. You must reserve some energy for your shining moment at the finish line. During the reps, breathe. This is seemingly a no-brainer, but one of the most overlooked exercises to improve performance. if you’re focusing too heavily on your body’s state of fatigue instead of controlling your breathing, a perceived lack of oxygen to the brain can take over and negatively impact your endurance. During the treadmill, think mind over matter. You’ve prepared for this. You’ve earned this. You deserve this. You’ve given yourself something to train for. All that’s left is the mental strength to get through your All-Out moments. Just think about why you signed up in the first place and let the adrenaline rush work in your favor. 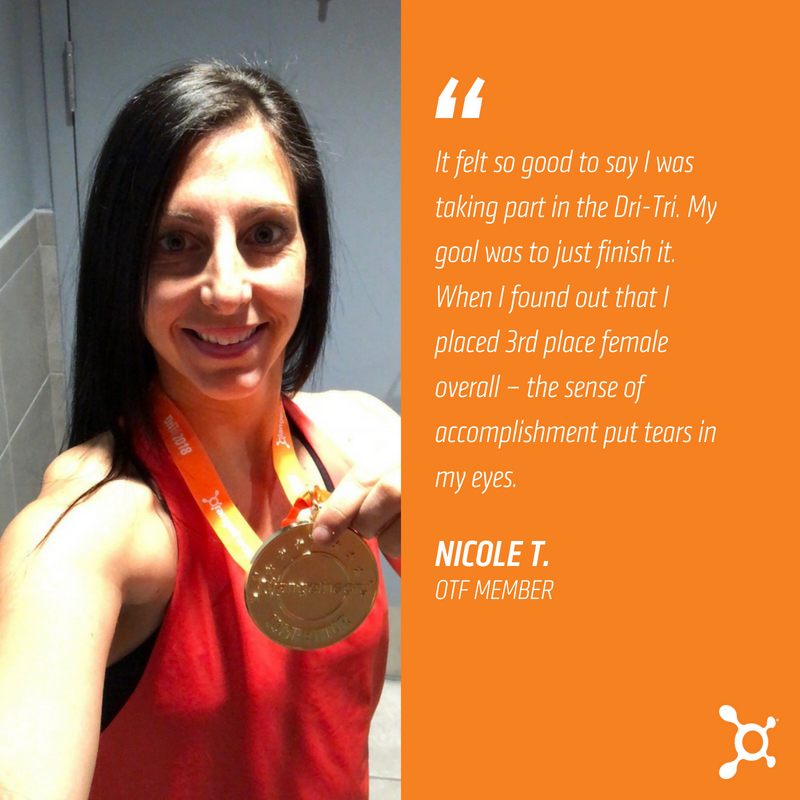 Take it from loyal member Nicole T., who crushed the Dri-Tri despite her medical setbacks. After an undetermined prognosis left her bedridden for almost a year, Nicole felt as though her world collapsed around her. In her weak state, she suffered from an unhealthy weight loss – about 100lbs – before she was officially diagnosed with Lyme Disease. After 18 months of treatment and the right prescription of Orangetheory, she has since come out on top. Not only did she slowly start exercising again, she felt she was up for a challenge. It’s the sense of accomplishment after every personal record or milestone in your fitness journey that will continuously inspire you to put more into the studio, and get more out of life. We urge you to power through your excuses, and be proud of yourself. One last word of advice? Don’t ever get discouraged. If you’re not ready to take on the full distances, we may have something right up your alley. With our Dri-Tri Sprint, you still get the full Dri-Tri experience, but you’re only committing to half the distances! Tackle the challenge by diving into a 1,000m row, 150 bodyweight reps, and a 2.5k run. You know what they say – the only workout you’ll ever regret is the one you didn’t do. Whether you’re looking for a challenge, or you’re looking for a way to spice up your normal fitness routine, use the upcoming Dri-Tri as an opportunity to test your strength, power, and endurance, and don’t forget to gauge your improvements over time. You cannot change what you cannot measure, and participation in this personal challenge will serve as a great first step. Contact your local studio and get geared up for this year’s challenge. You won’t regret it. How many workouts have you tried before you found a routine that finally stuck? We’ve all been there. You might remember the days of walking into your neighborhood big box gym and wandering around the various machines with no idea where to start – no direction on what combinations of workout machines will work in your body’s favor. You walk out feeling like you just wasted your time and money – two of life’s most prized possessions. Key takeaway? Don’t settle on a fitness routine that doesn’t inspire you to change. At Orangetheory Fitness, we take the guesswork out of exercise, and we also find ways to make your workouts anything but routine. With workout templates changing every day, and fun, engaging benchmark challenges strategically scheduled at different points in each calendar year, there are always new goals to set your mind to. And the only person you’re competing against is you. Constantly switching up the workout not only makes it more fun, but it helps challenge your body in new ways to ensure you never plateau. This day-to-day change will continuously change your body from the inside out. And that’s what will create results! No matter what you’re looking for in a workout, you’re sure to find it at Orangetheory. We tailor every workout to your unique fitness abilities to ensure you always walk out of our studios feeling successful. But the best part is, you might discover your inner athlete with all of our events throughout the year. Whether you’ve set your sights on an upcoming 5K, are conditioning for a triathlon, or are just ready to up the intensity, every Orangetheory workout provides a foundation for more strength, more energy, and more LIFE. Participation in the annual fitness events is not mandatory, but they’re a great way to quantify and track personal improvements over time. For example, how you performed during a 200M row in January versus a 200M row in April will be different with consistent attendance at OTF. For those of you looking to challenge yourselves or engage in a little friendly competition, consider participating in these annual (or semi-annual) events. The best part is, if you don’t want to compete, results are tracked via personal improvements in addition to a leaderboard. And again, they are for all fitness levels! Overview: Develop the groundwork for changing your lifestyle habits to start transforming your body at the cellular level. Perfect For Members Who: Want to kick off their New Year’s resolutions on the right foot, and keep themselves accountable for the full duration of the challenge. Why You’ll Love It: You have a systemized way of tracking your results each week, as you’re surrounded by a built-in support system cheering you on every step of the way. This helps keep you accountable to build a healthy habit and continue your fast track to more life. Perfect For Members Who: Strive to test their level of endurance in this semi-annual event, in an effort to make gradual improvements over time. If you want to test your fitness ability before diving into the entire triathlon, there is a Dri-Tri Sprint version available. The distances and reps are cut in half, but you still reap the full experience. Why You’ll Love It: You’re able to switch things up with a little friendly competition. Crush your personal bests and challenge your neighbors, all while pushing yourself out of your comfort zone, and into the Orange Zone. Overview: Track your mileage over the course of a month that will total the equivalent of a half-marathon, full marathon, or ultra-marathon by month’s end. Perfect For Members Who: Train for running or cycling competitions, or those who want to face their fears of long distance running. Why You’ll Love It: The process of tracking your mileage encourages you to go all out on the treadmill, bike, or strider in class in hopes of achieving your marathon goal. Overview: An intense fitness challenge for all levels, in which every class incorporates a surprise fitness challenge that’s a slight variation of the OTF workout template. Named workouts correlated with a specific focus of the day increase the intensity of the Orangetheory experience for 6 straight days. Perfect For Members Who: Love to spice up their normal workout routine with built-in fitness challenges each day of All Out Mayhem. Why You’ll Love It: You never know what you’re going to get. You will be shocked at what your body is capable of when you put mind over matter. Overview: Every workout within Hell Week represents a Halloween-inspired theme to ensure your heart rate gets in the Orange, and you’re burning long after the workout is completed. Perfect For Members Who: Crave intense workouts and enjoy getting in the spooky spirit for Halloween! Why You’ll Love It: Each challenge will push you, both mentally and physically, to achieve new milestones in your fitness journey. Plus, you can earn a Hell Week T-shirt! Overview: Track your rowing distance the entire month of November to strive for the most distance by month’s end. Perfect For Members Who: Aim to increase their endurance on the rower and get the most out of this power-driven exercise. Why You’ll Love It: You have the opportunity to row for a purpose. You can measure your distance and equate it to traveling somewhere around the world based on the mileage accrued. Overview: Enjoy these holiday-inspired workouts to burn off the additional calories that are consumed during the holiday season. But don’t forget to take a break – with Hell Week and Orange Voyage preceding this event, this one is really just for fun! Perfect For Members Who: Are determined to stay accountable during the hectic holiday season. Why You’ll Love It: Orangetheory Fitness studios turn up the heat in the cool winter season by incorporating festive, holiday-inspired workouts. Let’s just say, we get a little creative. At Orangetheory Fitness, we’re not just a studio with static workout equipment. The coaches, the community vibe, the sweat, the music, and the technology all work together to enhance the experience for you every single day – an experience that’s always changing, an experience that never gets boring. It’s all about what you put into the workout that counts. In case you ever wanted to know, the Experience Development Team spends roughly 30 days and 900+ hours creating, testing, and editing 90+ unique workouts designed to challenge members of all fitness levels across 17 countries and 900+ studios. It’s simple, really. Clint Eastwood said it best when he stated, “What you put into life is what you get out of it.” The vision of Orangetheory is no different: the more you put into the workout, the more you get out of life. For a science-backed, technology-tracked, coach-inspired group workout with personalized results, come into our Burlington, MA Orangetheory Fitness studio today. Led by a personal trainer, this hour-long HIIT class incorporates cardio, indoor rowers, weight training blocks, and floor exercises designed to give you results from the inside out for a longer, more vibrant life. Our energetic coaches will help you reach your personal fitness goals by providing options for all abilities and fitness levels. Our OTbeat heart rate monitors enable you to see personalized results in real-time so you know when to push harder, or scale back, in order to optimize your results. Whether you’re an athlete looking to cross train, someone looking for the first step toward their fitness journey or coming back after an injury, Orangetheory Fitness is for you. Live life all-out and book your first session today. Be sure to arrive 30 minutes prior to your first scheduled session at Orangetheory Fitness - Burlington conveniently located on 112 Mall Road. Unlike traditional gyms, you’ll have the opportunity to meet your fitness coach and discuss personalized fitness goals and concerns.